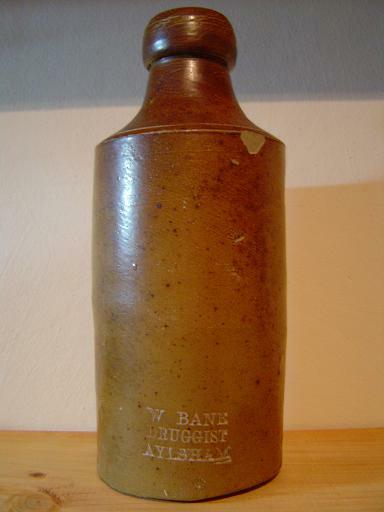 Ginger Beer Shaped Bottle Made By Powell of Bristol, Possibly Used For Boot Blacking. 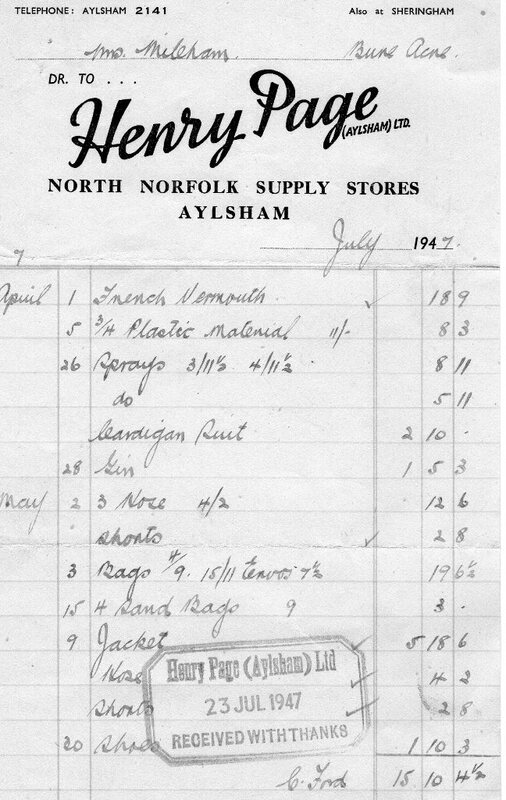 Impressed "J. Attwell Aylsham"
James Attwell listed as a boot and shoe maker in Red Lion St. Aylsham in 1875 and in 1883 at Hungate St. Aylsham by 1890 he had moved to Philadelphia Lane, Norwich. 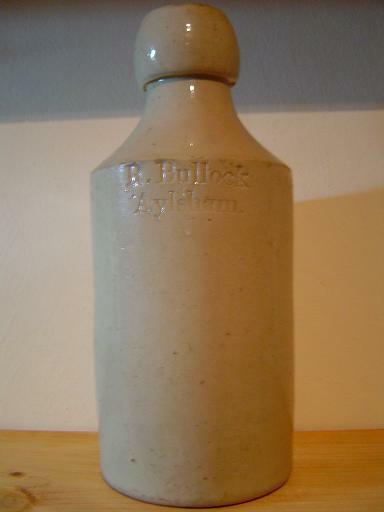 "W. Bane Druggist Aylsham" Ginger Beer Bottle With Large Oval J. Bourne Pottery Mark To Rear. William Bane Himself. William Bane Is listed as a chemist and druggist from 1830 up until 1858 at Red Lion St. Aylsham. "R. Bullock Aylsham" Made By Powell/Price of Bristol. 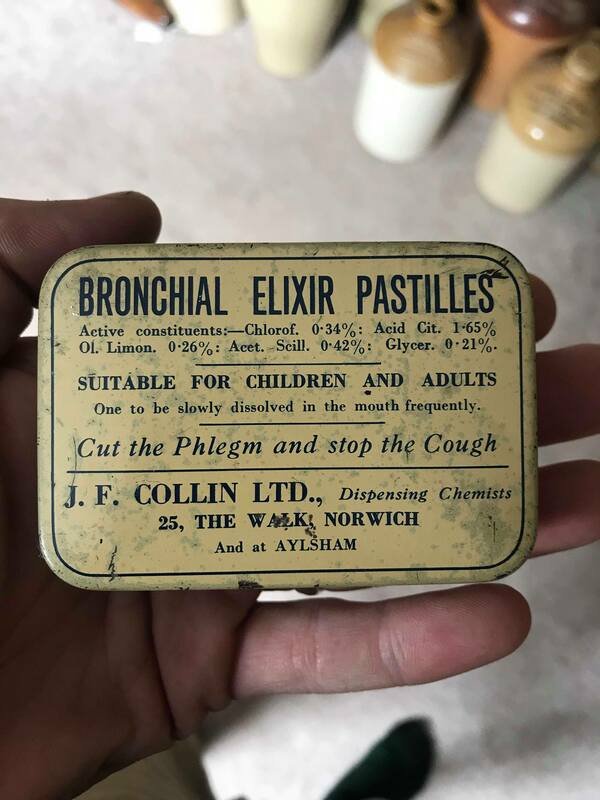 John Francis Collin is first listed as a chemist at Red Lion Street Aylsham in 1929. He continues to be listed beyond 1937. George Chemist Aylsham Embossed Chemist Bottle. Edward Robert George is listed as a chemist at Market Place Aylsham from 1875 until 1883. Listed as a veterinary surgeon in Aylsham from 1836 at Pinfold Street by 1845 he had moved to Cawston Road and was his last entry. 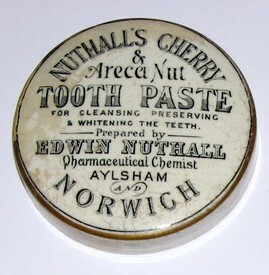 Pot Lid Printed "Nuthalls Cherry & Areca Nut Tooth Paste For Cleansing Preserving & Whitening The Teeth. 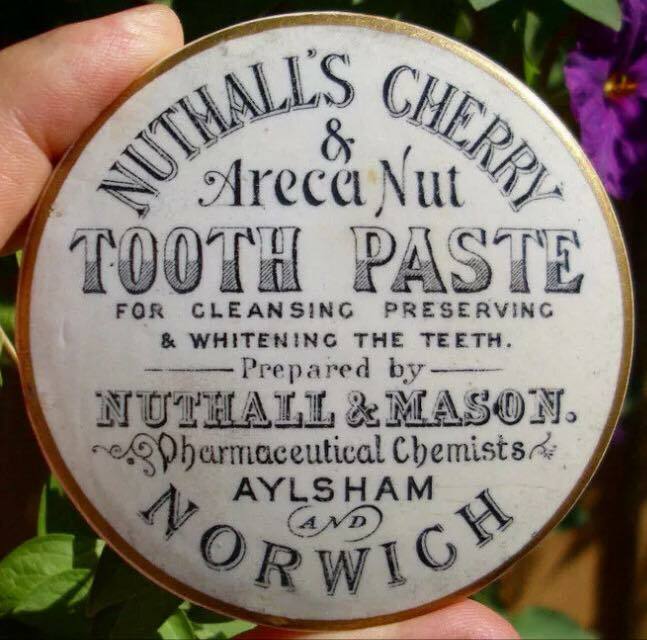 Prepared By Edwin Nuthall Pharmaceutical Chemist Aylsham And Norwich" Pot Lid Printed "Nuthalls Cherry & Areca Nut Tooth Paste For Cleansing Preserving & Whitening The Teeth. 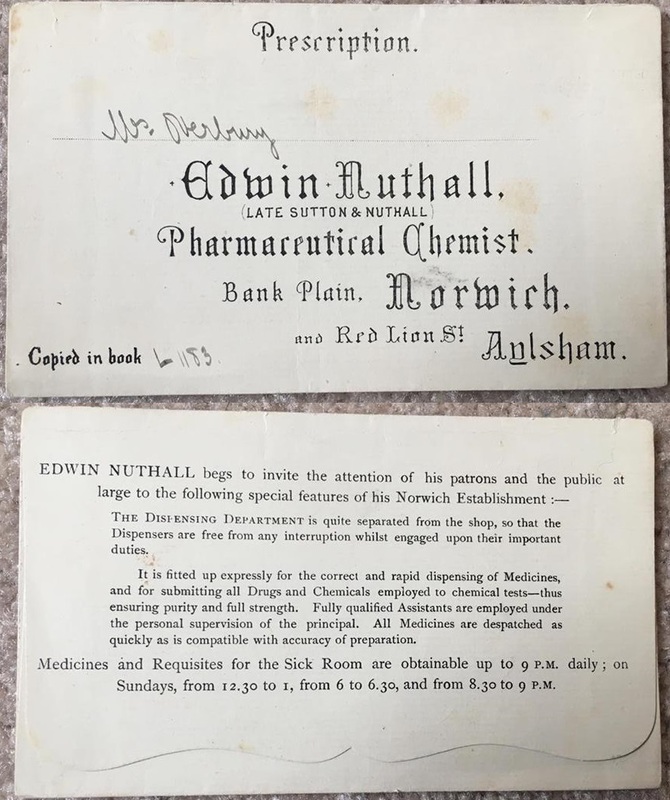 Prepared By Nuthall & Mason Pharmaceutical Chemists Aylsham And Norwich"
Edwin Nuthall is first listed at Aylsham in 1875 as an Pharmaceutical chemist at Red Lion Street by 1877 the business was listed as Sutton and Nuthall. 1879 was back to being Edwin Nuthall on his own until 1888 when he was listed as Nuthall & Mason up until there last entry in 1892. Edwin Nuthall was also in business in Norwich. 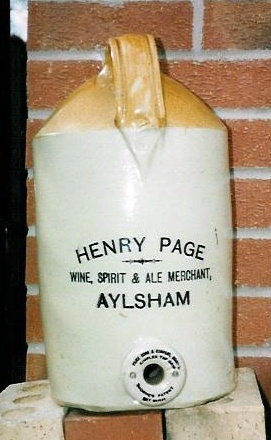 Tap Jar Flagon Printed "Henry Page Wine & Spirit Merchant, Aylsham" Two Tone Flagon Printed "Henry Page Wine & Spirit Merchant, Aylsham"
Four 1 Pint Beer Bottles Used By Henry Page In Different Colours And Styles. 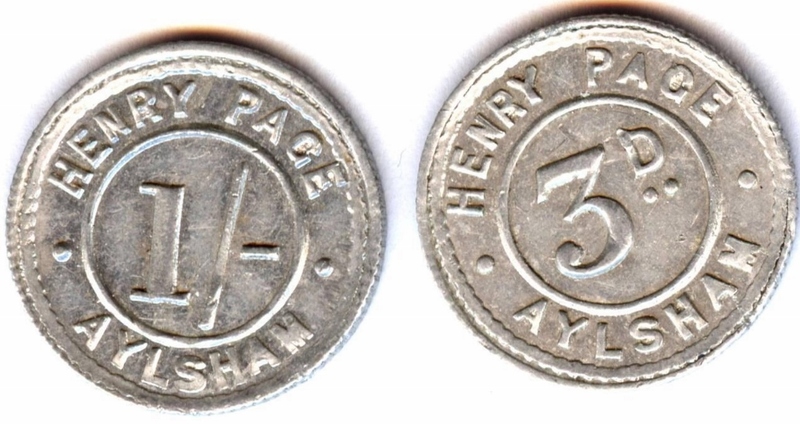 All Embossed "Henry Page Aylsham" The Brown Bottle Is Embossed "Henry Page Ltd Aylsham" Henry Page Billhead Dated 1947. 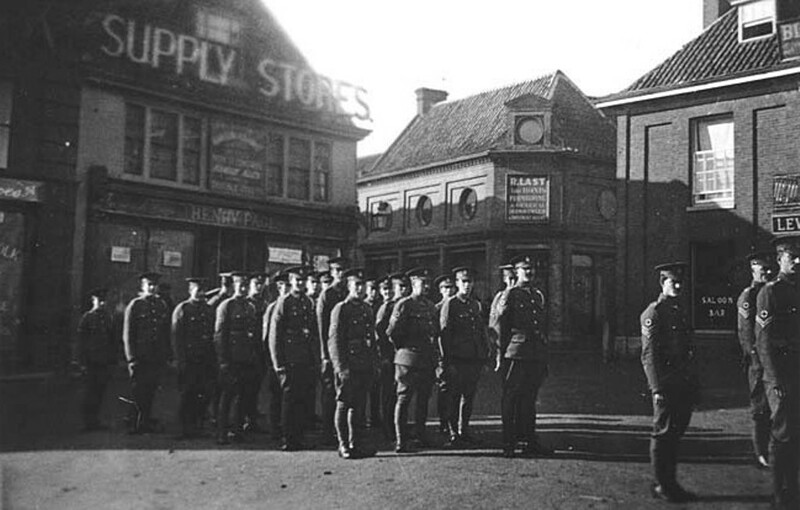 Newspaper Advert Henry Page Shopfront during the 1st World War. 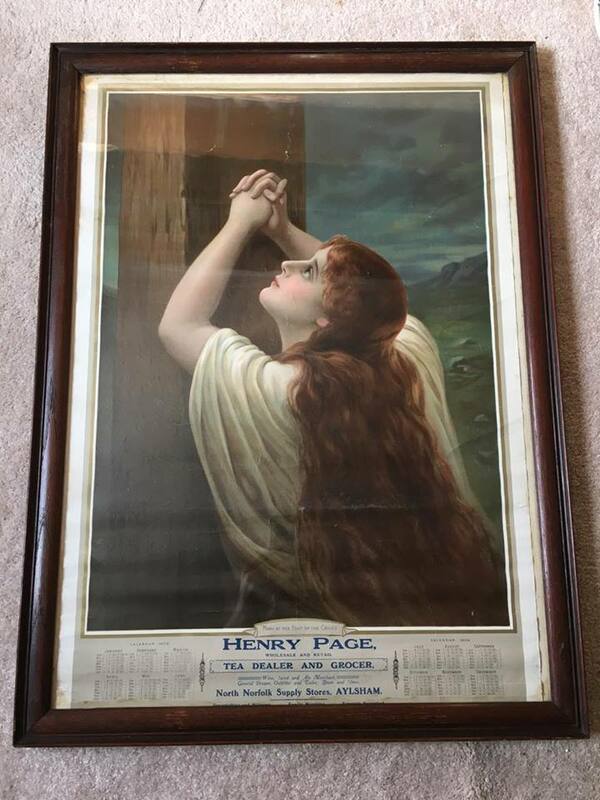 William Page was listed as a grocer & draper from 1850 until 1877 when Henry Page is first listed as a wholesale grocer and draper and wine and spirit merchants amongst other things until 1960 when the premises was destroyed by fire. Standard Codd Bottle In 6 & 10oz Size. James Barnett Pryke listed as a grocer and draper at the Millgate Stores Aylsham in 1890 and 1892 by 1900 he had moved to Loddon. 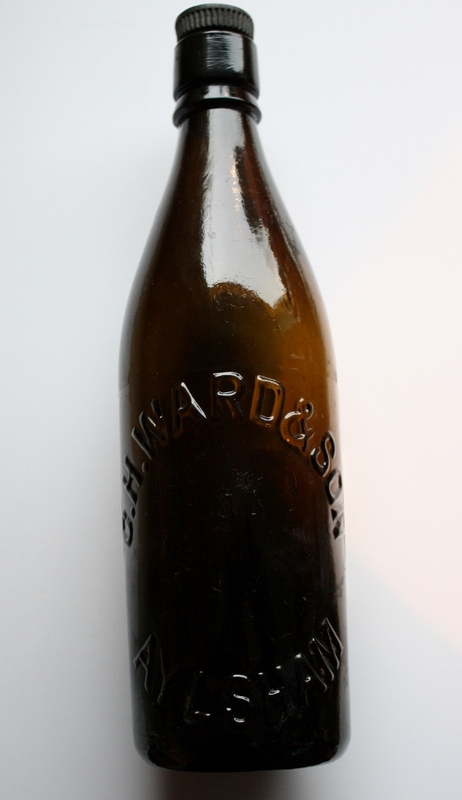 Stoneware Ginger Beer Bottle Used by A. W. Skidmore 1 Pint Slipglazed Porter Bottle Impressed "A.W. Skidmore Aylsham"
Arthur Wellington Skidmore listed in 1839 & 1845 as a glass & china dealer and iron mongers at Market Place. Last listed in 1850 when he was also declared Bankrupt. 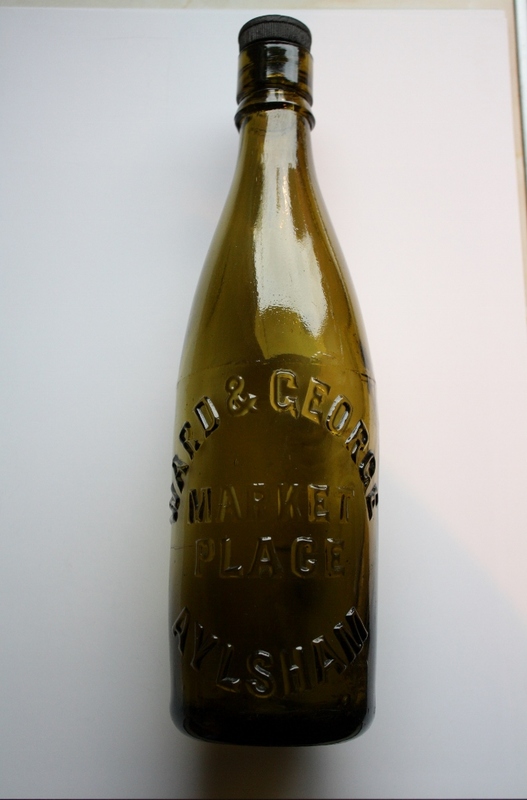 1 Pint Beer Bottle Embossed "Ward & George Market Place Aylsham" 1 Pint Beer Bottle Embossed "C.H. 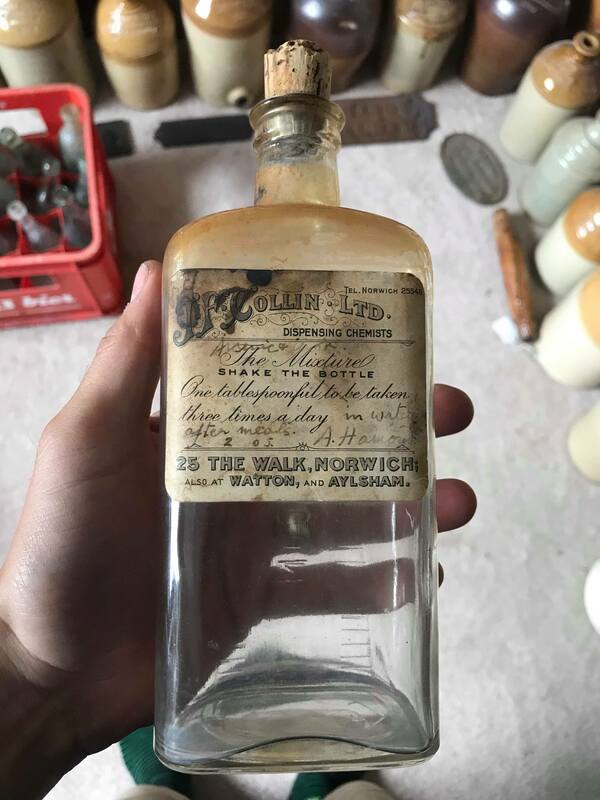 Ward & Son Aylsham"
1 Pint Beer Bottle Embossed "C.H. 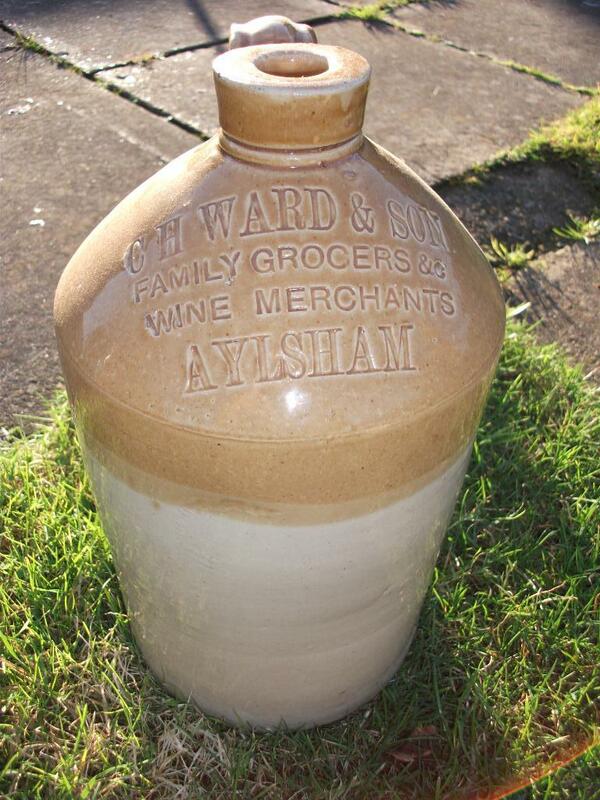 Ward & Son Aylsham" Two Tone Flagon Impressed "C.H. 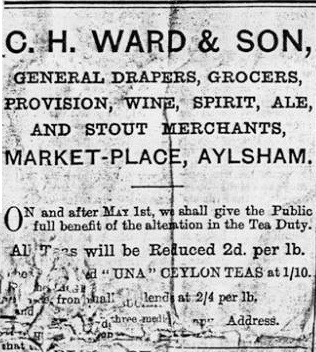 Ward & Son Family Grocers &C Wine Merchants Aylsham"
Advert from Charles Ward & Son London gazette notice from Stating that the partnership between Ward and George has been dissolved 1911. 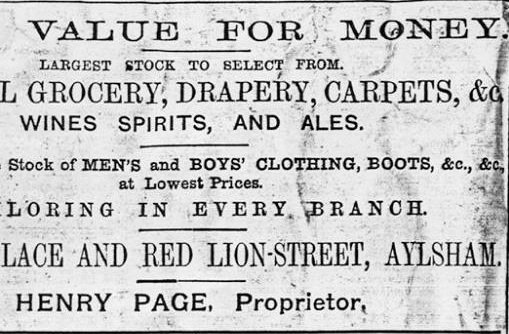 Charles Harvey Ward is first listed as a grocer & draper at London House Market Place Aylsham in 1868 his son Robert joined the company in1888 when they are also listed as a wine and spirit merchant. Robert Harvey Succeeds his father in 1908 and is joined by Alfred Real George to form "Ward & George". 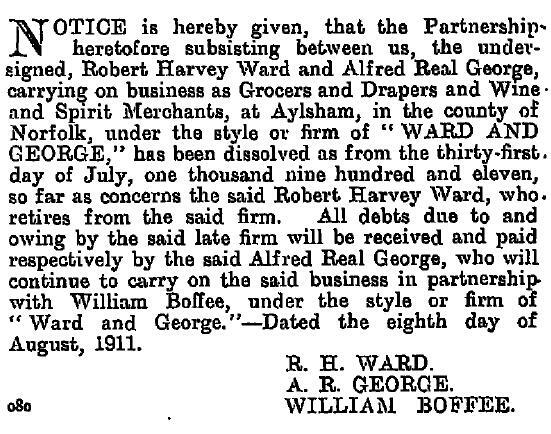 Robert Ward retires in 1911 and is taken over by William Boffee but the company continued to trade as "Ward & George" beyond 1932. Ginger Beer Bottle Impressed "H. Williamson Aylsham"
Henry Williamson was first listed in the "Bull Inn" Aylsham in 1856. 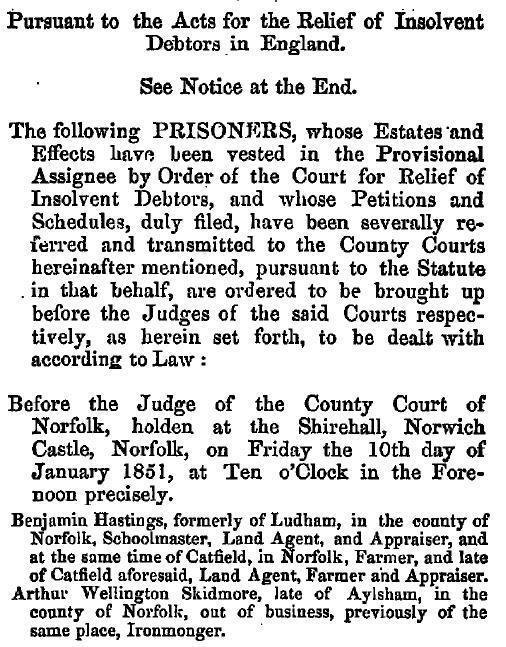 He was then listed in1863 as a green grocer in Red lion street Aylsham and continued to be listed as a shopkeeper at the same address until 1908. 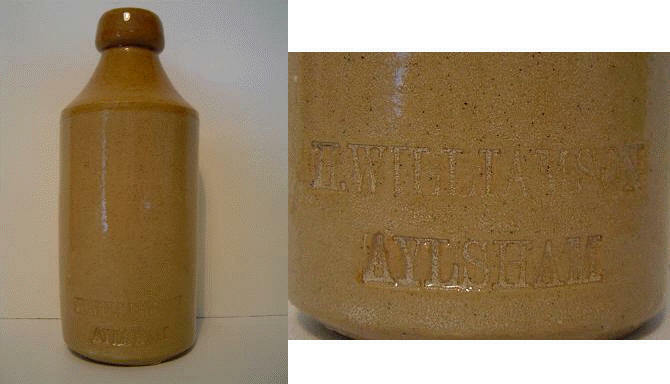 Salt Glazed Flagon Impressed "Wright Aylsham"